An unusual out of cycle post for me but I think it needs to be told. I should add up front this isn't something caused by Lemtrada - I'm allergic to a lot of meds in a lot of different ways so yes I'm one of those very sad people who read the fine print on those bits of paper that they put in the box (a few days after I start toking something because I don't want to 'fake myself' into looking for something. 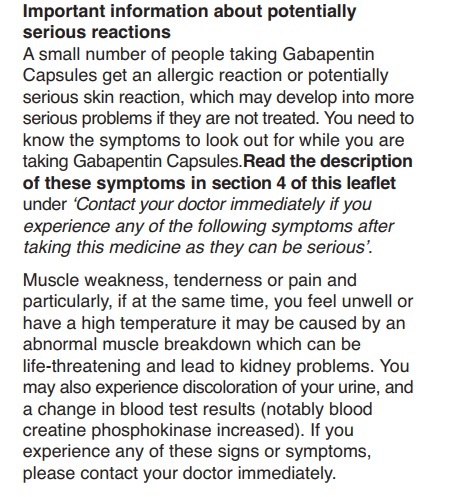 Gaberpentin – I’ve had to stop taking immediately because I’m having an allergic reaction to it. I should say I know Gaberpentin is frequently prescribed for people with MS for neuropathic pain. For me it was NOT prescribed for MS it was prescribed for the pesky C7 spinal problem I have and as of an hour ago it’s now on my list of ‘never to prescribe again because she's allergic’ notes on my medical record. I got out of bed yesterday and everything ached, all my muscles in my body. Just a dull ache manageable with Paracetamol and I thought nothing about it. My balance also had become substantially worse than normal. 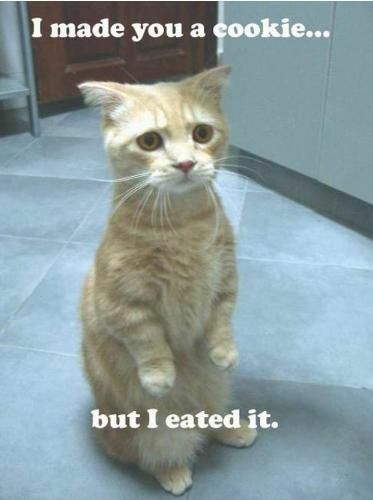 This morning same thing – I ached in all my muscles took a couple of paracetamol and toddled off to work a little wobbly. Needless to say having lost my younger brother to multiple organ failure (Kidneys and Liver) I freaked the f*** out was on the phone to the doctors immediately –can you be here in 30 minutes – yes sure I can the weekly project call can wait …. For those who read this regularly this next bit will be a ‘here she goes again hypothesising’ moment. For those who are new – please bear in mind this is me wondering out loud and in no way am I a medical person – what I am is a program manager / project manager in Telecoms – I analyse risk and mitigate It on a daily basis. So brace yourselves – here I go. · I wonder how many people with MS have symptoms like I have and just put it down to ‘MS Stuff / Weirdness’ and carry on taking it? · I wonder how many people who’ve had Lemtrada are taking Gaberpentin and have had these symptoms for a while or developed them post Lemtrada and put it down to 'MS Stuff / Weirdness' ? 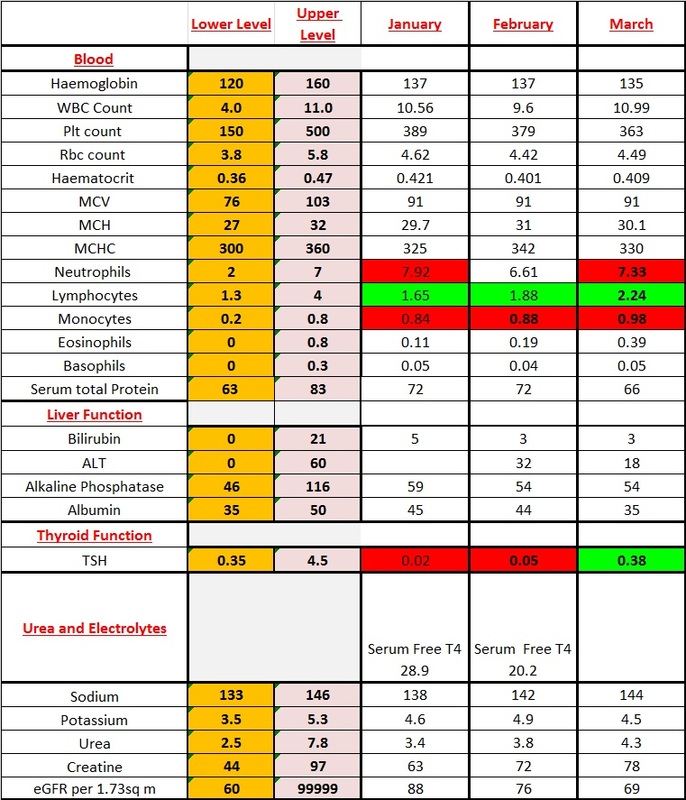 · And lastly the big one – Since that nice warning on the Gaberpentin paperwork says these feelings can be as a result of muscle breakdown which can cause critical or fatal kidney failure – The whole ‘Good Pastures / Anti-GBM’ warning with Lemtrada - could that also be as a result of this? So there we go – not my usual 2 pages of soap boxing, but interesting questions that should be asked and a little information that I think needs to be shared with anyone who’s an MS person, a Lemtrada person or just someone taking Gaberpentin. So it’s steroids for 5 days YUCK – I really hate these things but if they’re helping to neutralise the allergic reaction they must be done. Last week was a long and sleepy one, Bob was retired again at the back end of the week once my 12 hour sleeps each night helped put me back on track. It made for Tracy being a very dull girl though and Gareth got lots of game time. Amber is back to her normal beagle self, following her nose, staying on her feet mostly and only falling over occasionally as oldies tend to do. The sun is shining here today, it looks glorious out the window, but the brutal wind definitely takes the pleasure out of going out to enjoy the free vitamin D supply. Tonight I’m off to sign the paperwork for my new car, another Ford Tourneo because van like or not it’s the most comfortable, practical Dog and Bob mobile there is. The new one is shiny silver rather than grey and it has heated seats this time (sadly not leather) so I’ll have a nice toasty bum when it’s cold (which hopefully will be not needed for many months) Should be picking the new ‘little (not little at all) car’ before the end of this week. Last but not least – I’m sitting here at work wearing skinny Levi 501’s with my lovely cowboy boots. The weight I’ve lost recently is really helping with my mood, my outlook on life and my self-esteem / confidence. It’s been a really long time since I’ve just picked up a pair of jeans, eyeballed them and gone to the till with them. I got home pulled them on and felt awesome. It’s been a long time since I could do that – it’s been a long time since I even considered anything other than ‘fat’ supermarket cheap jeans. So I’m rocking my 501’s and feeling very happy.